What Are the Benefits of Retiring in an RV? 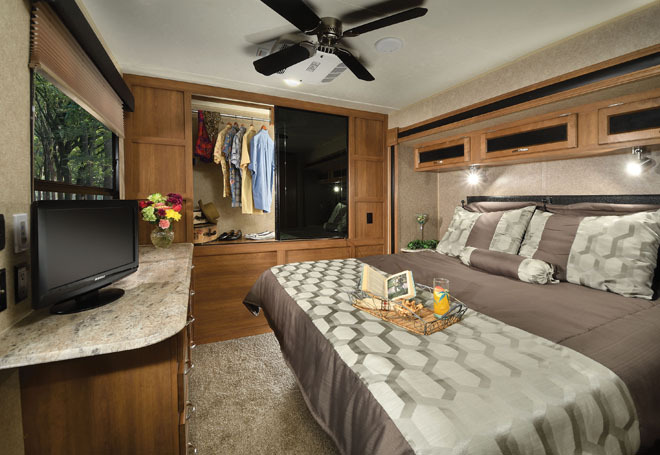 A Coachmen Catalina offers a simple yet luxurious life for retirees. Living in an RV really simplifies your daily chores. While you have new tasks like managing your waste and water, you can skip the major chores. No big houses to clean, often no yards to manage, and everything you need is in your RV or tow vehicle. When it comes to enjoying life, simplicity is a blessing. Living in an RV is an invitation to almost anywhere in the country. Want to spend a week in California? With the major national land, you can choose from a huge stretch of beautiful forests to park without worrying about huge hotel costs or finding someone to house-sit. Freedom to travel also comes with the freedom to stay somewhere as long as you want – and not a moment longer. With a house or apartment, you have roots that can be difficult to move. Leases and the process of selling a home can be shackle you somewhere that you’ve grown tired of. When you live in an RV, your home is wherever you park! Owning a home comes with major expenses. Even into retirement, mortgages can be daunting to keep up with, and sudden home repairs can easily eat into a year’s worth of vacation funds. Downscaling your life to travel in an RV means fewer things to worry about. Keep in mind, RVs have their own expenses too! But compared to living in a big house, they’re hardly a blip on the radar. With proper budgeting, it’ll be smooth sailing. Where Do RV Retirees Stay? If you’re not adverse to staying on the go and roughing it, you can take advantage of free dispersed camping on most national land across the country. While these parks and forests usually restrict you to around two weeks before you need to move, there’s always another park within driving range to set up camp. For those that love to live frugally, it’s a hard option to beat! The obvious choice for many travelers, campgrounds are a great compromise between staying on the road and enjoying the amenities of home. While getting a spot with a hook-up usually involves a small fee, and sometimes a reservation, these fees are small compared to hotels for the same duration. Almost every nationally-owned park will have planned campsites with power and water hook-ups. These let you keep your RV powered to enjoy all the amenities and entertainment options you have. Around the country are communities for lifetime RV owners to plant themselves and enjoy, whether it’s for a few months or a few years. Some campgrounds even offer monthly site rentals, so you can enjoy the massive parks without feeling rushed. These communities will be a bit more like traditional home living, which is perfect for those who don’t need a home but still like the idea staying somewhere familiar. You can park your Cedar Creek Cottage RV anywhere you want to. 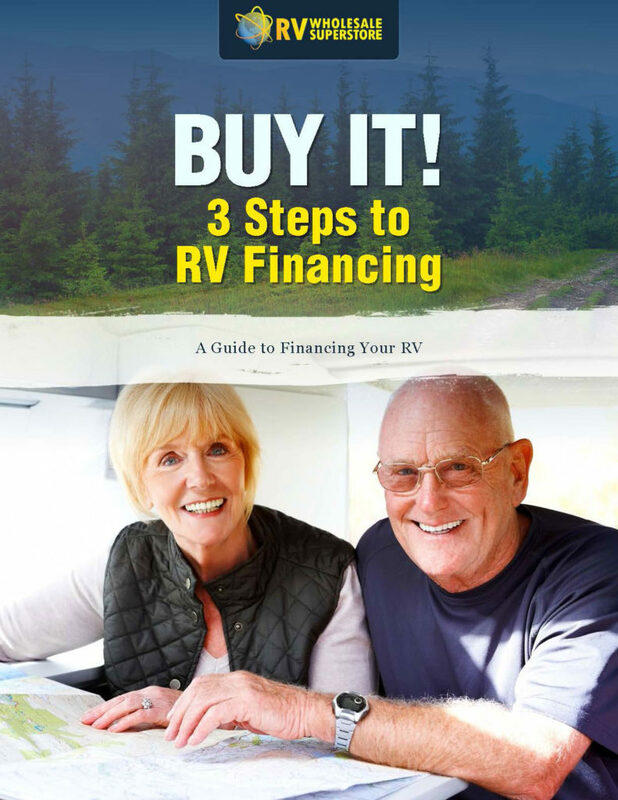 Should I Rent or Buy an RV for Retirement? For many, renting an RV sounds like the perfect middle-ground. When you work a nine-to-five, you typically only have one or two vacations a year to really enjoy the freedom of an RV. But when you’re retiring, you have all the time in the world. Considering the many years you’ll spend in your RV, it’s a no-brainer: buying beats renting. For starters, you’ll save money in the long run. But that’s only one advantage. Buying also removes the restrictions you might have to put up with due to the renting contract. If you smoke or have pets, your rental RV might not allow that. An owned RV also gives you full control over the vehicle. Do you want to upgrade or modify your RV? Have at it! Specialized equipment like solar panels for RVs give you additional freedom and save you money, perfect for the RV retiree! What Type of RV Should I Buy? This is the most important question of all when it comes to buying an RV for any purpose. Retirees should look for an RV in the same way that those living in RV full-time do. You want to have an RV that can support your lifestyle for long stretches of time. Is it big enough to support you and your spouse and/or pets? Can you pack all of your necessary belongings? All of these questions will lead you to the right type of RV for you. For those that typically travel with just a small pack, you can easily retiree comfortably in a smaller RV. If you need to have your whole wardrobe and a variety of top-of-the-line entertainment options, consider a luxury RV instead. Absolutely! Retiring with an RV is a great way to spend your time traveling and enjoying the world without skyrocketing your budget through hotel and airline fees. It gives you the best of both worlds: being fiscally responsible while still being free to enjoy your open schedule. 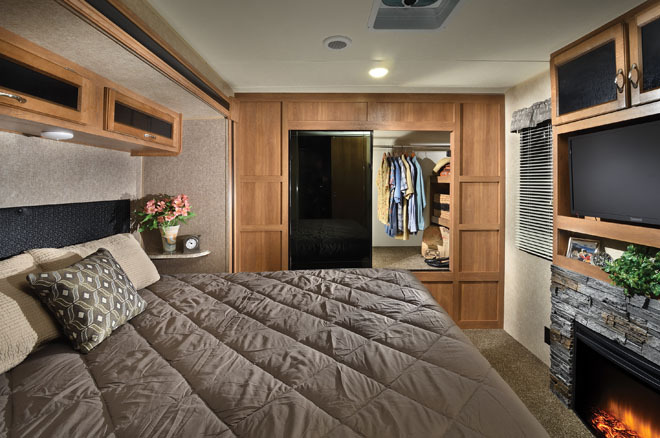 This luxury RV is perfect for retirees. Of course, like anything, an RV does come with some costs. However, proper budgeting allows you to easily handle these costs with plenty of cash to spare for fun. You’ll have the same costs you would otherwise, like food and personal care. The only differences will be instead of paying for utilities at home and a mortgage, you’ll have to budget for gas and the fees associated with your campgrounds or RV villages. 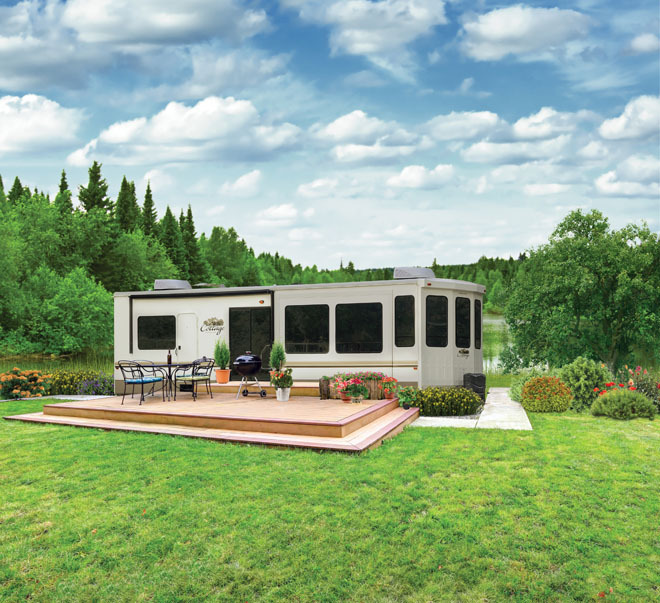 Make no mistake, RV retirement can scale as large or small as you want. For those looking to pinch every penny, you can take advantage of free camping at national forests and efficient campfire cooking. 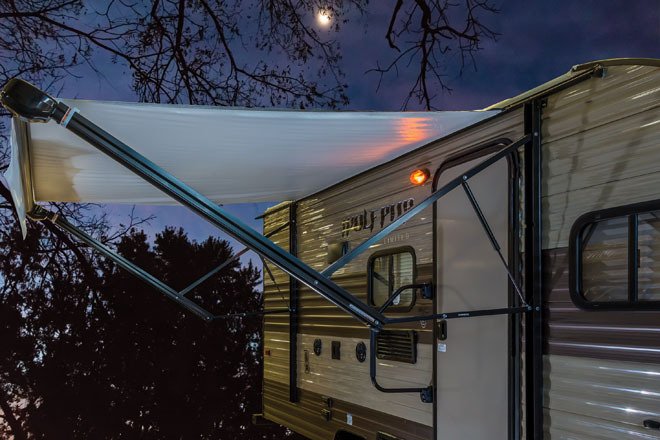 If you want to live large on the road, you can hook your RV up at major campgrounds or villages and enjoy local fine dining anywhere the road takes you! Ready for RV retirement? The professionals at RV Wholesale Superstore are here to help you find the perfect RV for you and your family. Visit us in-person at 5080 W. Alexis Road, in Sylvania, OH or call us at (866) 640-9871.